I went fishing on Lake Champlain yesterday from 7:30 am to just before 5 pm. The bite was never hot and heavy nor were the fish of quality size. The picture below was my only seed over 9″. The weather report was far from what was called for not that I am complaining. The wind was suppose to blow 15-20 mph all day but luckily it didn’t pick up till later in the day. It was also suppose to be a sunny day but that never happened either. There was actually a fair amount of precipitation throughout the day. That’s ice fishing in Vermont for ya! As for the crowd, there were quite a few people out there fishing until the wind picked up. I think the lack of fish and deteriorating weather pushed people out early. For the most part, every hole I fished had fish but the majority of them were filled with dink perch. There were a few areas that were replenished throughout the day though so I tried to get back while still searching around for better schooling areas. I found one spot that offered a good deal of snow coverage on the clear ice. I punched maybe 2 dozen holes in a small area that was about half clear ice and half snowpack ice. My first few drops produced decent seeds so I kept pounding the area. I was getting pretty frustrated with how frequent the little fish were stealing my bait so I changed up my presentation to a larger profile that included a plastic by Maki Plastics. Because the fish were still showing on the flasher, I put on the first plastic I found. It was a previously used red Maki that had turned to a maroon in my coat pocket. I then started having a lot of fish following from the bottom to just below the ice but not taking it readily like before while fishing meat. Three holes later, I landed my first crappie of the day. 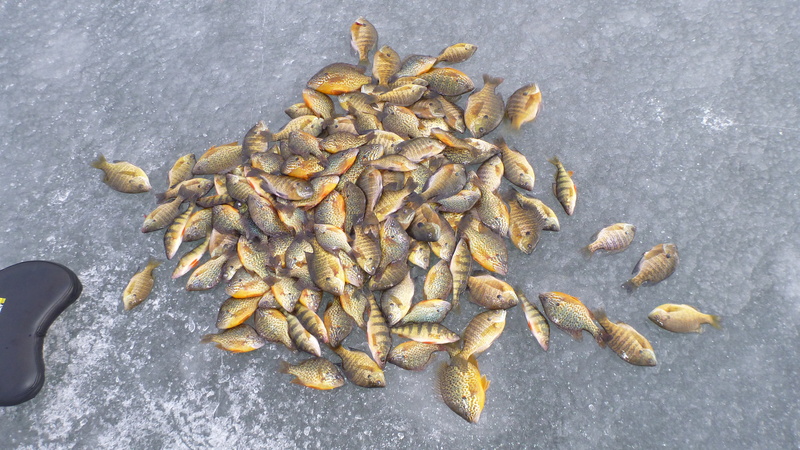 Over the next two hours I iced a dozen crappie and a good pile of gills and seeds. About the time the fish stopped showing on my flasher people started to clear out so I was able to move to other areas and not punch holes the rest of the day. The rest of the day was fairly consistent but still not a great bite. I try to analyze my day after every trip. I think that if I don’t try to learn something from every fish I will never get any better. Some fish want it fast while some want it slow. Some want it put right in their mouth while others want it taken away so they have to charge. 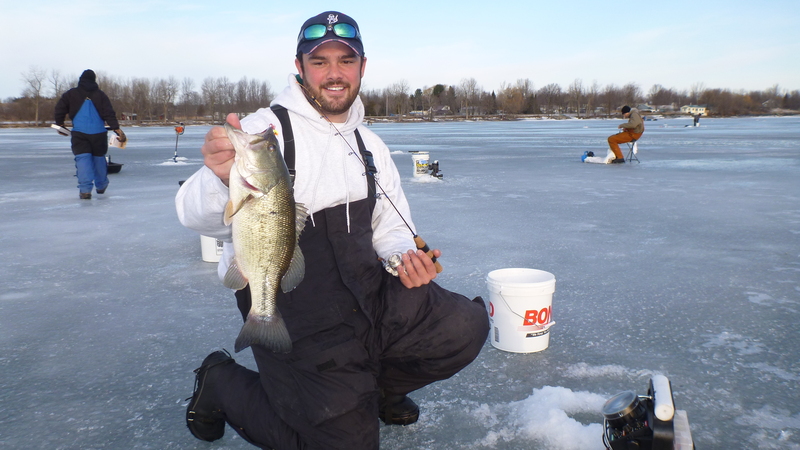 Figuring out what the fish want can make the difference between landing chips all day or catching a limit of quality fish especially on Lake Champlain where the fish are abundant. Some days it doesn’t matter though… You can do everything right or everything wrong and it could be the best or worst day on the water. My grandmother had a sign above her kitchen doorway with a picture of a cow in a green field on a beautiful bluebird day with its foot in a bucket with the quote: “someday’s you step in it, someday’s you don’t”. Not everyday can be a great day on the ice but one thing that I have learned is that it is better to work on new tactics and techniques and not catch fish than to go home early without a meal and twiddle your thumbs. So looking back at yesterdays trip I ask myself, what did I learn? Well to start, don’t throw out your used plastics! Maki Plastics are durable and you can hook them anyway you want and still catch fish. Also, sometimes a new color can be made inside your pocket that is just what the fish want for the given day! 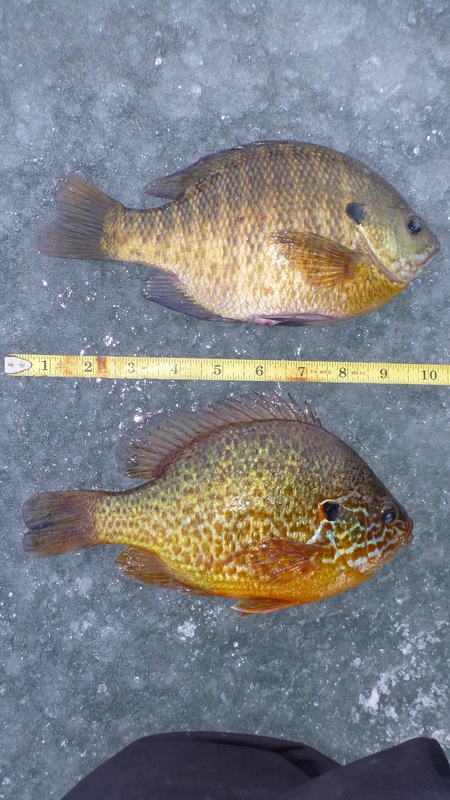 When I switched from using spikes to a plastic not only did I weed out smaller fish but I started catching an entirely different species that was already in the area but I just didn’t know. Secondly, I changed my mind set that when there is clear ice, look for ice that has texture or snow to break up my silhouette. 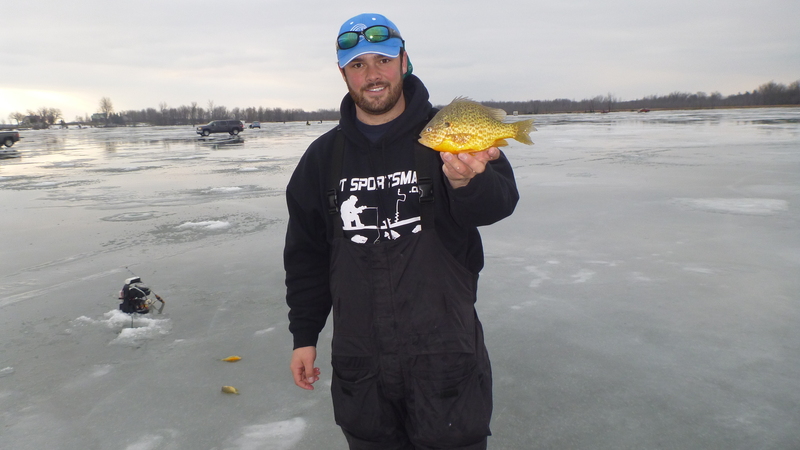 I caught more sunnies on clear ice in an 8″ hole than anywhere else. Lastly, get out on your own. When I caught my crappie I was away from everyone else. There were no holes and no one withing a short distance of me.